His Holiness The 14th Dalai Lama graciously accepts Amatyus Thangka, created by artist Tsogtsaikhan Mijid, at the cultural conference event. 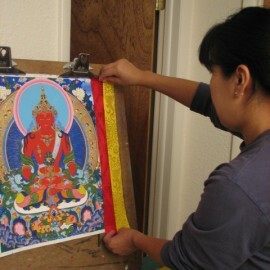 Tsogtsaikhan Mijid created and gifted the large scale “Amatyus” Thanghka with silk embroidery by his wife Batkhishig Batochir to his Holiness the 14th Dalai Lama on his anticipated conference at the University of Denver. 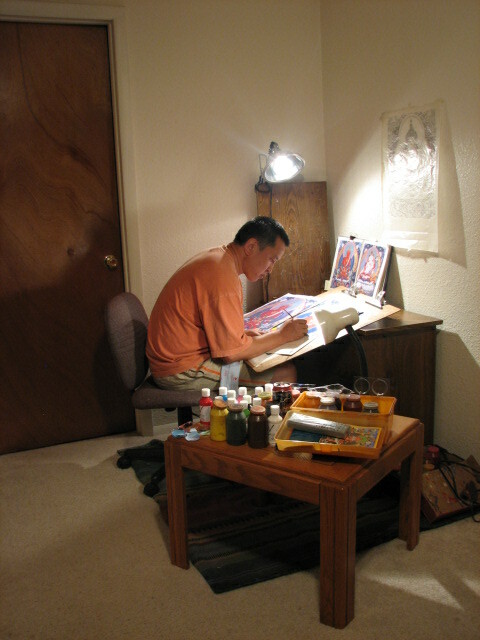 The event was hosted by the Colorado Mongolian Association and Tibetan Association of Colorado on September 17th, 2006 in compliance to the national PeaceJam conference held in Colorado including his Holiness the Dalai Lama and 10 nobel laureates. 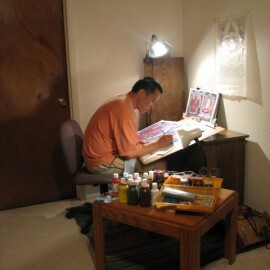 I am excited to have embarked on an exciting artistic and spiritual endeavor as of recent. His Holiness the 14th Dalai Lama was scheduled to arrive in Denver for the PeaceJam conference a couple weeks ago followed by a special appearance and talk at the University of Denver for the Mongolian and Tibetan communities that reside in Colorado. The event was a joint venture hosted by the Colorado Mongolian Association of Colorado and Tibetan Association of Colorado. Of course this became big news for my Dharma Wheel Buddhist class and the many religiously devout Buddhist Mongolians of Colorado. 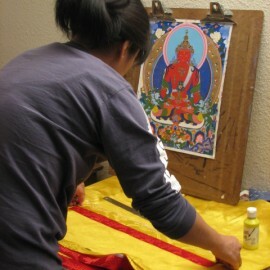 In conjunction to the event, my request of gifting a specially drafted Thangka to His Holiness on behalf of the Colorado Mongolian community was generously accepted by the organizations involved and so began my creation of the “Amatyus” Thangka. 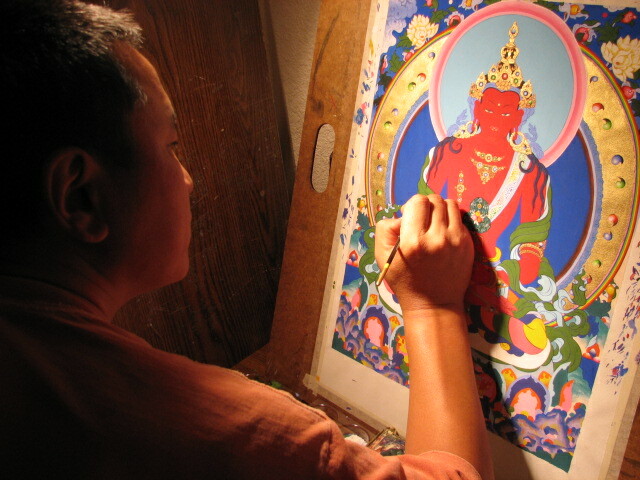 The Thangka painting process consisted of a few weeks since I was on a very limited time frame before the arrival of His Holiness. 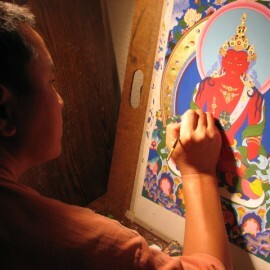 For the Thagka, I chose to create the Amatyus Diety (Tibetan: Tsepagme), known as the Buddha of limitless life. Amitayus is the reflexive form of Amitaba and is the embodiment of infinite life and therefore the focus of the life practices that remove the possibility of untimely or premature death. He brings about a healing of sicknesses, degeneration and imbalances in the five elements of the body due to karma, excess and unclean living. He is often red but sometimes white in color. His two hands rest in his lap in the mudra of equanimity with the palms facing each other holding the Vase of Life, that is filled with the nectar of immortality. 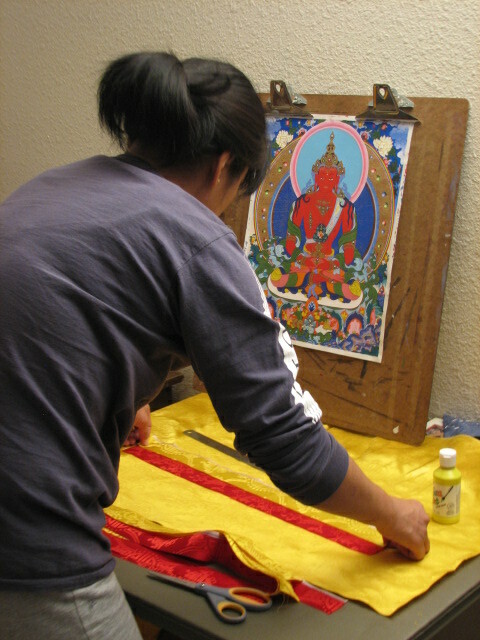 Traditionally, the Thangka painting process consists of discipline and grueling labor, a practice that is very significant to my life and spiritual beliefs. Thus I was extremely honored and blessed to dedicate myself to creating the Amatyus Thangka wishing His Holiness and all sentient beings health and longevity. 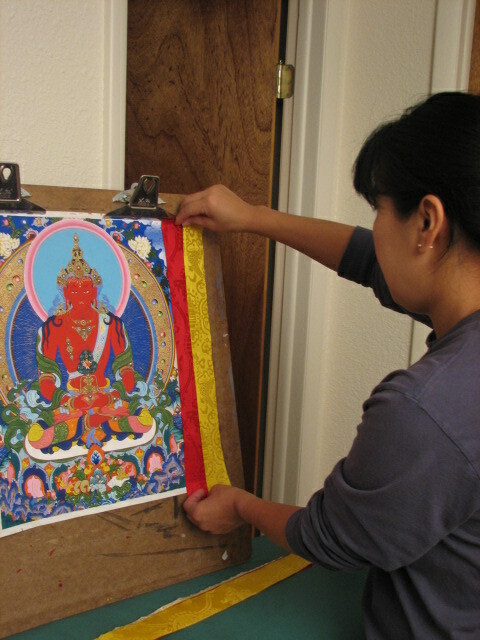 The finished Thangka came out wonderful which was then beautifully embroidered by my wife Baja. On the morning of September 17th, His Holiness arrived at the University of Denver while a large crowd of Mongolians and Tibetans gathered outside. After everyone was seated inside, I had the honor of gifting the Amatyus Thangka to His Holiness The Dalai Lama on stage and in person. To my dismay, The Dalai Lama graciously accepted the painting as he kneeled forward in prayer stance to bless the Thangka. It was truly an incredible and indescribably moment that I will cherish with me forever. 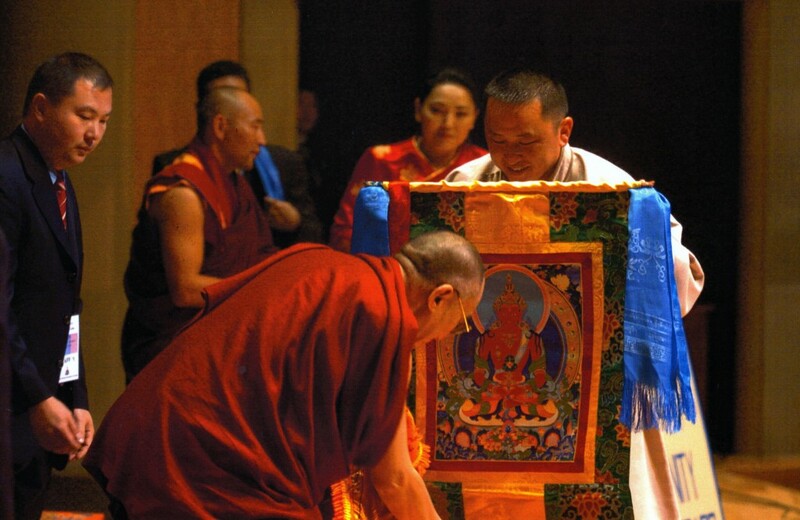 You can also go to my exhibitions page to see a picture of me gifting the Thangka to His Holiness the Dalai Lama.